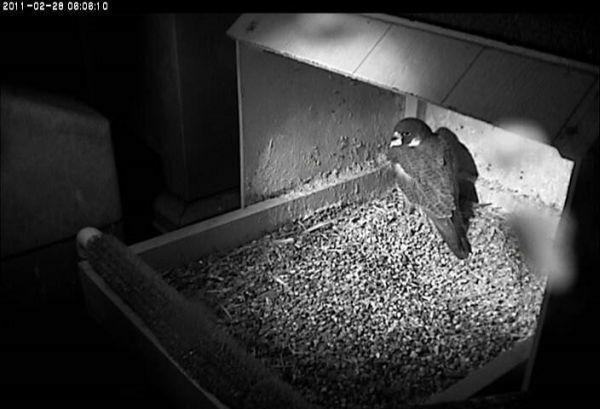 At the Cathedral of Learning, Dorothy spent last night perched at the nest. Here she is sheltering from this morning’s pre-dawn thunderstorms. As far as I know female peregrines don’t roost at the nest unless they’re ready to lay eggs in a couple of days. However my knowledge of this is very limited. I only learned about it last year when we were able to see the nests at night for the first time. It seems too early for eggs, but who knows. We’ll just have to wait and see what this means. I’m home with a broken elbow, so screen is on—-Dorothy has been hanging out at or near the nest all day. Too bad about your elbow! D has been playing hard to get. She’s been perching near the nest (I can see from here) but won’t come to it no matter how much E2 chirps for her. Dorothy didn’t spend last night at the nest. This actually made me feel better that everything was normal.